Soundproofing is one of the best investments you can make for a home studio. As important as it is to have the right equipment, even the most expensive microphones and audio interfaces will be limited in a room that isn’t properly acoustically treated. If you’re struggling to take your recordings to the next level, before upgrading your gear, consider purchasing a studio soundproofing kit from Soundproof Cow. 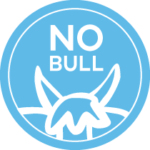 Soundproof Cow knows how to soundproof a room or a recording studio and we understand how each of our absorption materials fit together to create the best acoustical treatments. That’s why we offer convenient, affordable studio foam kits that contain all the basic soundproofing essentials in a single package. Instead of buying each component by itself, which can be quite expensive, we’ve put together studio foam kits based on the size of the room you’re trying to soundproof: small, mid-sized and large rooms. 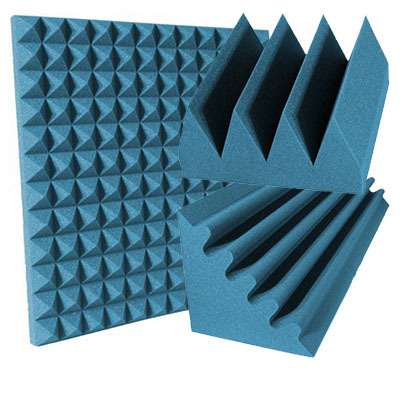 Each studio foam kit comes with a pyramid studio foam, corner trap foam and bass wedge foam. Several different colors are available to suit your personal style. Small studio soundproof kits contain 18 2” pyramid foam panels, four 48” corner traps and 24 6” bass wedges. Mid-sized studio soundproof kits contain 26 2” pyramid foam panels, four 48” corner traps and 24 6” bass wedges. 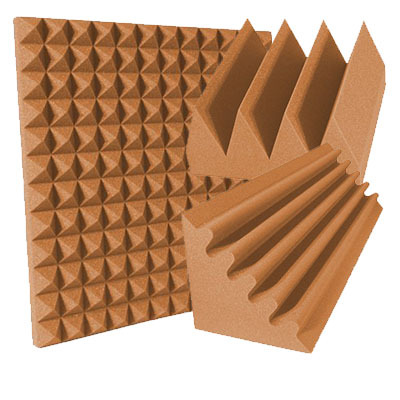 Large studio soundproof kits contain 36 2” pyramid foam panels, four 48” corner traps and 24 6” bass wedges. Working together, these components provide complete acoustic coverage that will dramatically improve the sound quality of your recordings. All kit components are made from professional-grade acoustic foam that is specially engineered to absorb high, low and midrange frequencies. As well, quality construction offers protection against rips and tears, even in a busy studio space where collisions with instruments and other gear are common. Our studio acoustic treatment kits are a complete solution for soundproofing a home studio. When properly installed, they will keep ambient noises out of your recording space and minimize the nuisance reverberations that can muddy sound within. Our products are also a great choice for band rehearsal rooms and for serious home theater setups. Check out individual product pages for more details. We’ve put together an extensive library of resources that will help you understand the basics of acoustic room treatment and set up your purchase in the most effective manner. If you have any questions about which studio foam kit is right for you, feel free to call us or fill out a no-obligation soundproofing questionnaire.